MSI’s Kitchen Visualizer is an excellent tool for novice designers looking to find harmony among the basic material selections for the kitchen: countertops, cabinets, floors, and mosaics. However, one could spend hours playing with the myriad options available in the Kitchen Visualizer – when a more strategic use can produce the best results. 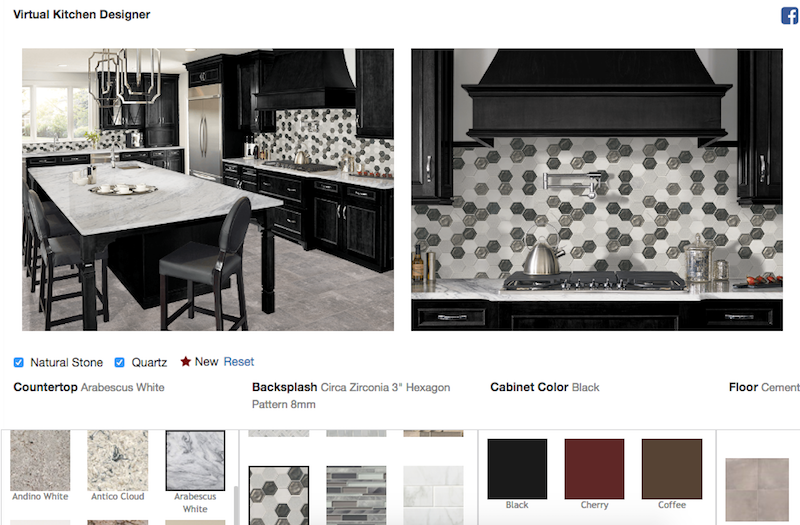 It may be tempting to click away on the Kitchen Visualizer tool, randomly pairing beautiful materials in an instant. Nonetheless, when every variable is changed each time you try a design, it becomes very difficult to settle on any one design or make a decision. That’s where a little design know-how can help to bring a cohesive theme into focus. Initially, you should decide if you like light or dark cabinets. Currently, the trend is dark cabinets with lighter countertops for contrast. This is a particularly practical trend because dark color cabinets will hide drips and splashes between cleanings, and countertops, which get cleaned more frequently, will highlight drips and splashes for quick, sanitary cleanup. Additionally, light countertops tend to show off colorful foods to their best advantage. Whichever you decide, light or dark, keep in mind that this will be one of your two dominant colors. In design, the formula is typically to select two dominants and one accent. As a dominant color, it’s usually best to keep it simple with a basic color and save the attitude for the accent. KITCHEN VISUALIZER TIP: The Kitchen Visualizer tool offers darker cabinet colors in Cherry and Coffee, a mid-option of Honey, and Maple and White for lighter cabinet options. If you have a non-traditional cabinet in mind, such as stainless steel, select White in place of stainless, as it most closely replicates the brightness in the room. Likewise, if you are looking at a bolder, non-traditional color for your cabinets, like a vibrant blue acrylic, choose Coffee – though it will not be the same color as your blue cabinet, the goal should be to replicate how the cabinet will affect the size of the room. Next, move on to the flooring. Your instinct may be to move right to the countertops to get that contemporary contrast you desire, but flooring is more likely your next dominant color. It should contrast with the cabinets, but complement them at the same time. Keep in mind that if the cabinets and the floor tile are too close in color, the look will be overwhelming, with too much of the same material in one area. 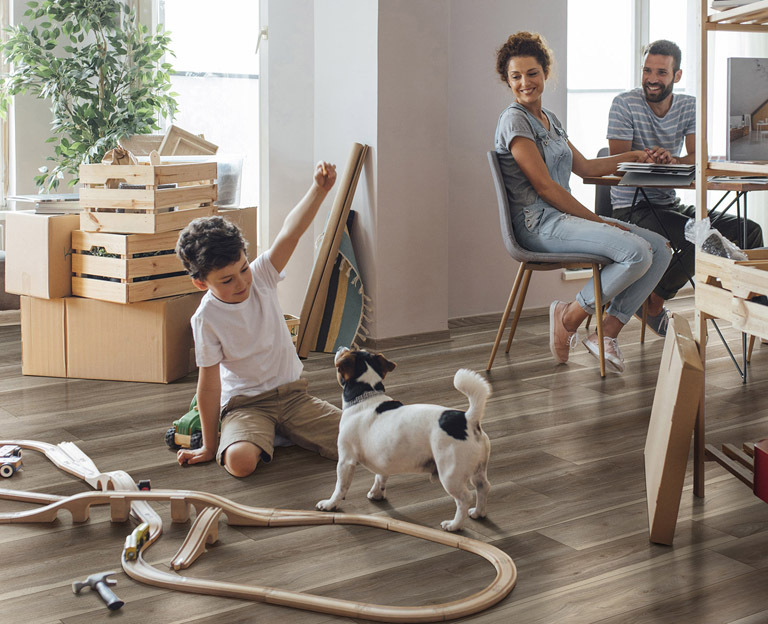 If your floors will be wood, such as durable porcelain wood tiles, be sure that your cabinet wood and floor wood are of the same tone, though not of the same color. KITCHEN VISUALIZER TIP: The Kitchen Visualizer tool currently offers 6 options for floors. As you make your selections, it will help to consider what color will contrast nicely with the cabinets but will also be the best fit for your lifestyle. Alternate between cabinets and floors until you find a desirable and practical framework for your kitchen. 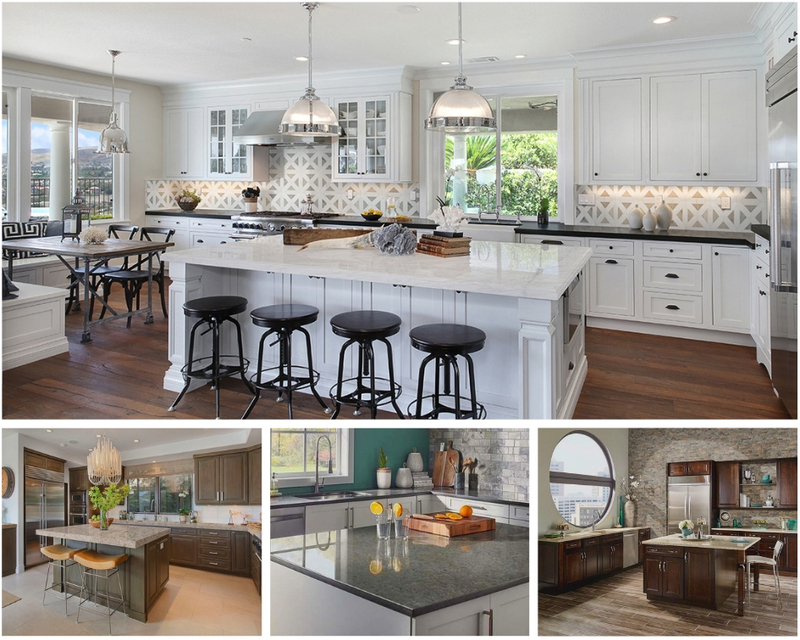 When you have settled on the best cabinets and floors for your kitchen, move on to countertop selection. Countertops should not exactly match the floor at risk of appearing too busy, but should be similar enough so that the horizontal lines of the kitchen will feel in harmony; the rising vertical expanse of cabinets will provide contrast. Once you’ve settled on a countertop that works with the floors, then look at them in relation to the cabinets. Again, the contemporary trend is light countertops against dark cabinets – but light cabinets and dark countertops remains a timeless look as well. KITCHEN VISUALIZER TIP: Ubatuba Granite and Black Galaxy Granite are two popular dark countertop selections. 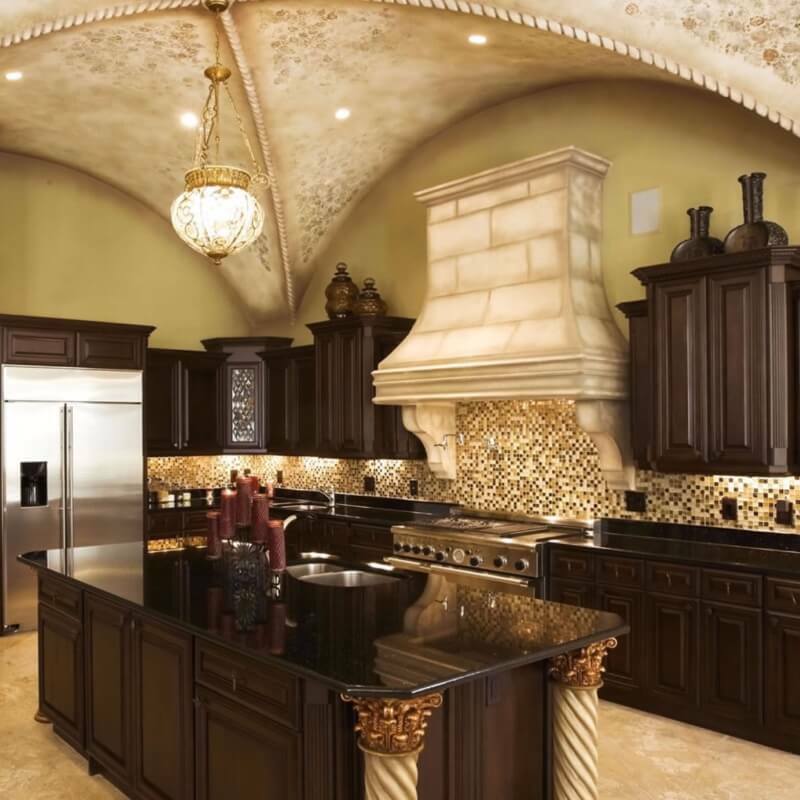 If you are looking for a dark countertop contrast to light cabinets, consider starting with one of those dark neutral selections in the Kitchen Visualizer and move to more colorful tones as desired. Colonial Cream granite, White Ice granite, and Crema Caramel granite, in contrast, are some of the popular light countertop selections. Start with these and then warm up or down as needed. As countertops are often the most likely candidate for replacement to update the look of the kitchen, you may be doing a remodel of countertops only. If so, select the cabinets and floors closest in color and style to what you currently have and enjoy playing with the Kitchen Visualizer. Here bold colors against your more simple choices in cabinets, floor, and countertops will work wonders for giving the room personality. Mosaics are also a great opportunity for showing off countertops, so pick a color or tone within the countertop and exploit it in your backsplash tile for both interest and continuity. KITCHEN VISUALIZER TIP: Remember that your mosaic tile will be your accent, your attitude, so don’t be afraid of a statement wall that stands out. Going too neutral here can have the result of looking like more of the same. If you don’t see a mosaic tile in the Kitchen Visualizer that speaks to you, MSI offers an expansive wall tile and mosaics collection. Be sure to investigate all your options by fully exploring our website. We offer glass, porcelain, stone, metal mosaics and combinations of all material types. Matching your cabinets, floors, countertops, and mosaics isn’t all about coordination and contrast. 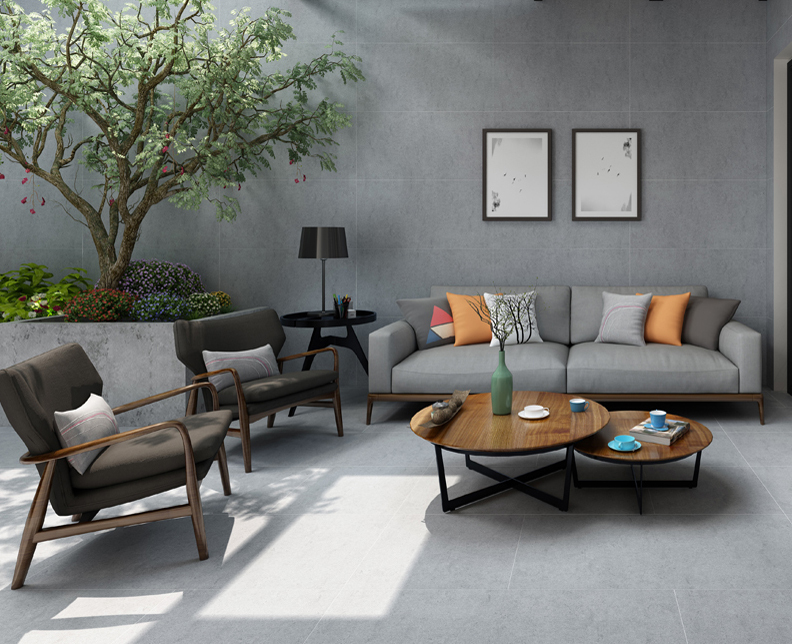 It also involves matching materials to your lifestyle and overall theme of your home. We hope these tips will help you to utilize the valuable Kitchen Visualizer tool quickly, to lessen the amount of time you spend considering your design and move you forward to the fun part – implementation of your beautiful new kitchen!